Ive had this watch since 2012 and it has done very well, have changed the battery once in 2017 and it is still going strong. The watch is incredibly durable, to the point that it has been dropped from ~ 20 meters, slid along tarmac, bit with tennis rackets, cricket bats and -15 degrees c in the alps. from all that there is a few scratches on the band and the logo has been scuffed, but has survived. I still use this watch as my 'beat up' watch that I take sailing, kayaking and biking on a regular basis. Highly recommended!!! 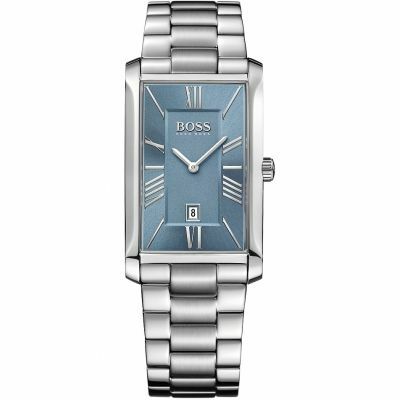 Beautiful watch, sturdy looking bought for a gift. Service was great very quick and affordable prices, and packaged well. Overall very happy with this Casio and delivery service. Top quality rugged outdoor watch. Amazing features at this price and waterproof to an amazing 200m. 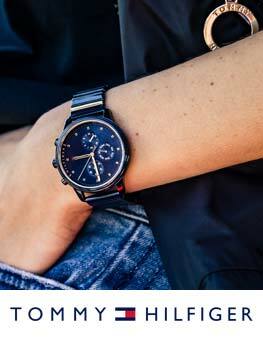 Service and delivery from Watch Shop is second to none with amazing next day delivery. Second time Ive used Watch Shop and Ill definitely use them for my next watch. A great watch. Bought because it’s rugged, reliable and trustworthy. A colleague of mine “breaks watches regularly” but has had his G-Shock for 2 years and it’s still going strong and looking good. Bought this as part of birthday gifts for my husband - its chunky, well made, his favourite present!\r\nIt is easy to use, everything is in the right place and its easy to read and the light is bright.\r\nFor a man that has many watches I think this one wont come off very often.! Cheers Casio and Watch Shop. love the watch, its well put together, crisp and great for use at the gym and outdoor activities. my only criticism would be the wings on the inside can pinch on the skin when bending the wrist which i removed. apart from that a great product. Lately I decided that I needed a new watch that is reliable, durable, fashionable, functionable and aesthetically pleasing. So I hopped into the internet world and started looking and searching like a hawk preying on a mouse, day after day. Logged into numerous sites including ebay and amazon, I was not looking into any brand of watches in particular but I knew that there was a particular name on my mind, something I have heard about or read someday-the G-SHOCK watches. G-Shock is a line of watches manufactured by Casio designed to resist mechanical shock and vibration. 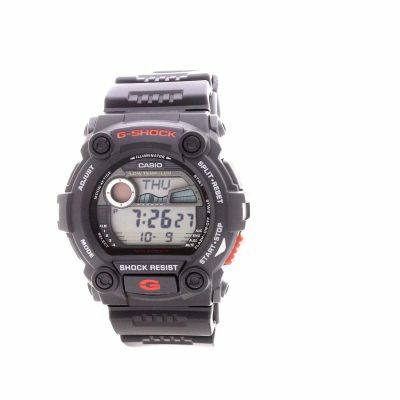 Its full form is Gravitational Shock, hence the abbreviation g-shock. They are designed primarily for sports, military and outdoors-oriented activities and nearly all G-Shocks are digital or a combination of analog or digital and have a stopwatch feature, countdown timer, backlight and water resistance. Yes, in todays world knowledge is power and power is making decisions. Google is your friend and mine too and as soon as I asked for its help I was immersed into the almost infinite line of g-shock watches but of all the g-shock models I searched and contemplated about, I fell in love with a specific one, namely, the G-7900-1ER. When I looked at the price tags for this g-shock I was not only in love but also head over heels in love! From where do I start? At first glance, the looks of this watch on my laptop screen made me wonder if the photos were edited by an artist. I mean the watch is incredibly aesthetically pleasing to the eye! Is this real I said to myself? The next thing I saw was a link to this site-watchshop and I immediately searched for this model which I fortunately found that is in stock and available for under 70 euro! Needless to say what I did next and just 4 days after I ordered the watch, the G-7900-1ER was around my left hand wrist! 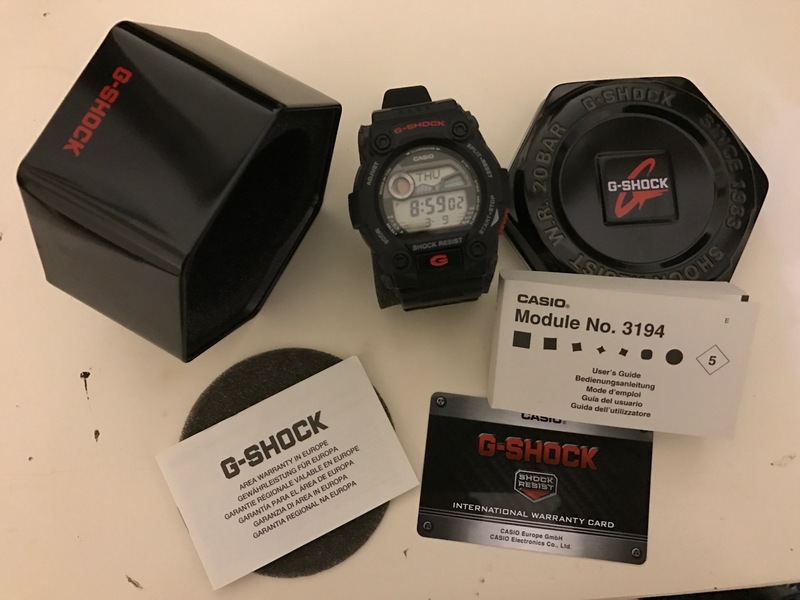 The watch came in a black metal box with the G-shock logo on top of the lid as can be seen from my picture. Inside, the watch was fully covered with a soft spongy like material including a piece at the top and at the bottom of the box to fully protect the watch. Furthermore, included with the box there were the manual and the international warranty card. The whole package was in pristine condition, just what I needed to see on the first time I bought a g-shock watch! Yes, I am a bit OCD!!! The second I took out the watch and felt it in my fingers I noted that if anything, this is one very durable watch, no cheap plastics, no cheap rubber straps, no falling buttons, the watch is pure and simple, solid! The base of the watch is stainless steel, the whole watch may look chunky and heavy to a layman but believe me, when I tried it on, my hand felt happier and not heavier! Apart from this, the watch feels very comfortable to wear plus it feels very secure, no way it can get loose from the clasp by itself. As you can see I ordered the black model which comes with some red touches like the red button of the start-stop function. Black with a touch of red are two of the top colours that really go together, nicey! I initially had thought that for this price this would be a watch that one will use as an everyday time piece for work etc excluding the weekends-when one needs to dress to impress! but was I wrong! Its a magnificent watch, a watch that one can wear casually or formally, when going out on a Saturday night, yes the watch is very fashionable too! This is practically a watch that one can wear for every occasion and yes for you men out there, does it make you look manly when you wear it? Hell yeah!!! You can surely feel it!!! An electro-luminescent panel causes the entire face to glow for easy reading. Auto Light automatically turns on the EL backlight when the watch is tilted towards your face for reading. You can also just press the G button at anytime you want to illuminate the display. The light which is bluish in colour is intense enough that its easy for the owner to read the time etc. when its dark. The moon phase indicator shows the current moon phase based to the earth. Time lapsed, interval time and end time are measured to the nearest one-hundredth of a second. This model has two independent stopwatches, each of it can time up to 1.000 hours. For fans of precision-the countdown timers help you to remember specific or recurring events by giving off an audible signal at a preset time. They then count back automatically from the preset time. The time can be set to the nearest minute and up to 24 hours in advance. Ideal for people who need to take medicines every day or those who do interval training. This model is equipped with 5 independent multifunctional alarms. One of these alarms is a snooze alarm. This clock has the perfect alarm for any type of appointment. The model is equipped with a total of four repeat alarms: 1- daily alarm, sounds at the same time each day, 2- date alarm, e.g. to help you remember birthdays, 3-monthly alarm, sounds on the same day at the same time each month and 4-alarm for every day of a particular month. It takes only 1 battery. Had enough of reading guys and pals? I mean look at all those details! Is this an awesome watch or is it not!? Of course it is, one great watch indeed. To me, its perfect, others may disagree or nag about this and that but hey for the price it has, the new four point design protection for the screws and face of the watch, the not hard to press large buttons, the display format which is so easy to read, the ability of the watch in providing a very user friendly approach for the owner and all the other features listed above, yes this watch is unbelievable! I have owned other digital watches including some from citizen, diesel and others but I can undoubtedly say that none can come as close as this g-shock watch especially when it comes to durability eventhough I have not owned this watch for long. It feels too sturdy and strongly built to compare it with the other watches I have at home. This watch will probably outlive me!!! 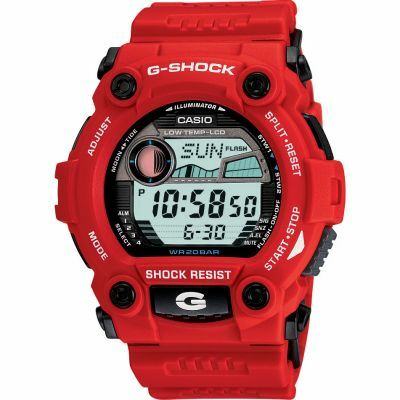 Oh, and I forgot to say that the g-shock 7900 comes in two other colours too, one in white and blue and the other in full red! I just preferred the black colour with a little touch of red, specifications are all the same for the three of them! Final thoughts? Well, I have not yet tried the precision and reliability of the moon and the tide features but that aside, I really cant find one single flaw about this g-shock model, the design, the technology, the structure, the practicality of this watch, just flawless indeed! Casio, you are awesome!!! The only thing I would have added to this watch if I was the manufacturer is simply more option colours to choose from, that is all. Listen guys, as I always say, when there is a doubt, there is no doubt at all! Do yourselves a favour and go buy this watch, you wont be disappointed, not for one moment!!!! Fantastic watch at an even better price. Super fast delivery at a cheap price and excellent customer service. Loads of features on the watch, with various stopwatches and although a big watch it doesnt feel heavy. The numbers and figures are simple and easy to read and the illuminator light very powerful. Would highly recommend. Auto-illuminator works good but I prefer manual illuminator which I can turn on by pressing G button on front. Shock/Water/Low-temperature tested at work and I cant see any problems so far, everything working fine. Mineral glass fully working, couldnt do any scratches and also all the information displayed on the screen are very good viaible. Moon Data works very good and Im happy because of it as Im a big fan of astronomy. The Tide Graph also works good but I dont need it as I live far from the sea. 2 stopwatch functions easy to use and very good visible on the screen graph same as 5 multi alarms. They are loud enough to wake You Up from afternoon nap, easy to setup, Snooze mode works good same as hour signal. World time function very usefull if You have someone in different country as me, so from now on I dont have to count or go in to website to check what time is NYC to call my sister, 3 sec of changing mode and I know if she still sleep or not. At the end just wanted to say that the functions like automatic calendar or 12/24 hours timekeeping are working very good and the synthetic resin band is very comfty as I wear my watch almost 24 hours and cant say any bad word. I always prefer Casio watches in generally but this one was definitely a premium model for a reasonable price once discount was applied. My husband loves his watch.. he is so impressed with everyrhing it does and the comfort of the watch! Fantastic watch! Really pleased. Easy to read. G shock is an amazing product line , however the price offered at Watchshop is competitive and you can be sure of beating any cheapest price offered by rivals. Well this is a spectacular watch, it has more specs on it than a watch worth 7 times more in price!! First class service. Watch excellent, ideal for hard working hubby! Excellent product and great value. 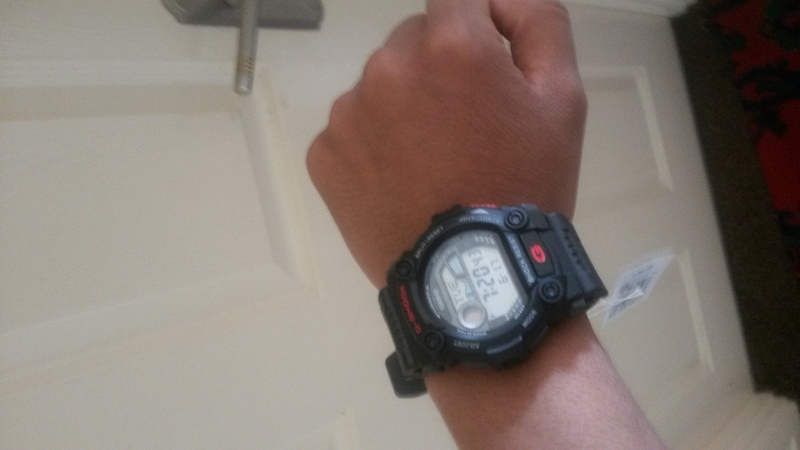 This is my first G Shock. 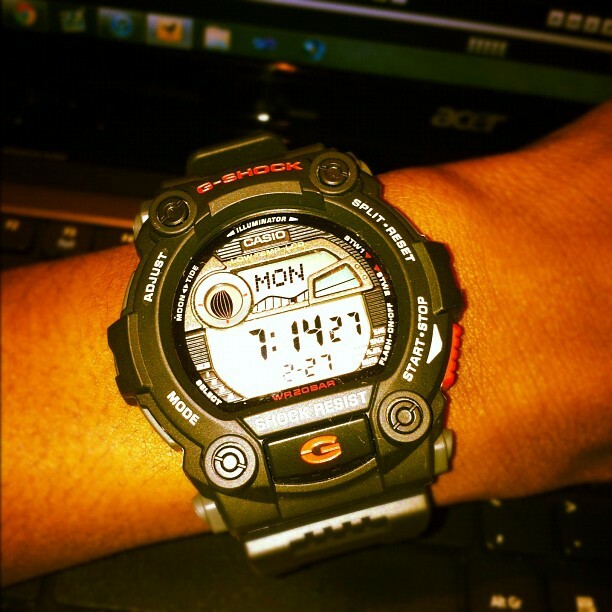 Watch was purchased for work purposes and have to say I chose the best g shock for the job. Very clear screen. Great functions and not over chunky. Back light is very good. Unlike some of the the analog back light this one lights the whole face. To anyone out there wondering if its to chunky, too heavy, concerns over build quality or poor lighting think no further. Fab watch. Excellently packaged, fast delivery. Have ordered with you before and will keep coming back. Thank you. Great service first time I have used this site. Impressed with next day delivery to NI. Watch is great looks lot better than in pics very comfortable and sturdy rugged design have been wearing it ever since bought it and it can take a few knocks. Back light is good and plenty of functions to mess around with although I dont use half them nice to have. My first time to buy a G-shock, and first time purchasing with Watchshop. \r\nThe delivery was fast, and received the watch just 2 days after making order. \r\nThe watch looks better then I thought. Although actually I dont need the moon phase or the tide, but features are great. I tried to swim in a 4-meter deep pool and the watch was still working perfectly. \r\nJust wearing it for one week, seems great so far. Great watch. Actually looks better than in the pictures, comfortable and reliable. I think this is a great base model for the whole G-Shock series, with the only thing feature maybe missing being the Tough Solar. Happy with the purchase! Really fast delivery, which i can always rely on from Watch Shop and the watch was in perfect condition. Quick delivery and great product. Watch Shop is thoroughly recommended. So very quick and easy to spend money on your site! Love it! I bought this watch as I liked the look of online. I wasnt disappointed when it I got it on the click and collect service via Goldsmiths. To be honest I didnt think the watch would be suitable due to the size of it, however the opposite is true, its very light and comfortable. I use the alarm for getting up for work. I just enjoy wearing the watch for its aesthetics as well as it being a useful watch. Great service as usual from The Watch Shop. Great watch and great service in terms of delivery! Quick and easy despite being a busy time around Christmas! I bought this watch about 3 weeks ago and so far its been brilliant. As a builder I needed a more robust watch and this has been bashed, scraped and covered in water many times. Even after all this it still looks great and works perfectly. Would highly recommend! Lovely watch, bought for my sons Christmas. Great size, not too bulky. Nice colour, just subtle enough so its not too plain. Excellent back light. Just what he was looking for - cant say anything about the workings as hes not worn it yet but Im sure it will live up to its expectations. Great watch so far. Had it a week. Set up was easy once instructions were read. Looks great on the wrist as the picture shows. Looks great, the black with the red is a very nice colour combination. Understated but classy. If youve not had a G-shock before, definitely does take some time getting used to the size and bulkiness after owning a small leather strap watch. Thats about it in terms of cons so far. Great watch! Fabulous multi functional watch purchased as a gift for my husband. As well as the usual features of a casino watch, this watch shows tide times - invaluable for the fisherman in your life! Excellent service from the Watch Shop as usual. very happy with purchase has all functions I need and more, rapid next day deliverly, couldn,t be happier well done watch shop. Bought this watch for my son - it arrived quickly, great packaging for a gift and a really good price. He was thrilled with the watch. The watch arrived on the expected delivery date. Good service overall and I will recommend to my friends as well. Very good watch, does tides, moon phase etc. 2 stopwatches and one timer, four alarms etc. It is quite a big watch but it has a lot of features which make it worth it. It is a nice design which fits well on my wrist even though I am quite thin. It is durable I use it for outdoors purposes and reliable. Well worth getting, especially for the price. This watch is the best quality you can ever buy. Its water proof..best suited for the english weather. Great Price and fast delivery. This is the second watch I have bought from here and I have been very happy both times. Excellent watch, looks cool works perfectly and has allot of handy functions. Great value rugged watch. Wanted something that I wouldnt break surfing and this has worked out really well. State of the tide is great for the surf too! 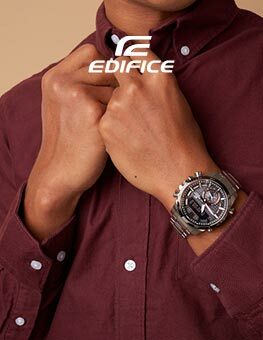 Watch is very bulky, probably more suitable for the outdoor, rolled-up sleeves type of adventurer. Good quality, quite complex, requires careful reading of the instruction booklet provided. I wanted a reasonably priced watch which I could wear for sailing. The Casio G7900 ticks all the boxes for me with a useful set of functions from basic day/date/time through moon cycle and tide status to a readily adjustable count-down timer for race starts, while you can still monitor the time, and two stopwatch functions to measure intervals between boats. All packaged in a shockproof case waterproof to 200m. Excellent watch. Very pleased. I bought it for myself as a pressie and i own 2 g shocks now. There brilliant tough and reliable. Wont buy any other brands now. The watch came day after i ordered it. Well packaged up and excellent condition. 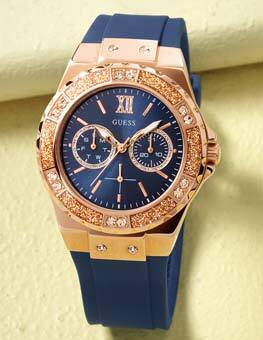 Dont hesitate about getting this watch, trust me you wont be disapointed. Thankyou watchshop fast and efficient service. it is a fantastic watch with a nice clear display,comfy strap and not too bulky. it is a slightly large watch but looks great when wearing it but the watch is slightly more dark grey than black. There are a couple of problems not with the watch but with the instructions, they are not the clearest when describing how/ what you have to do when adjusting for tides you actually want to display other than that it is very good. Super quick delivery. Ordered Saturday night and received on the Monday. Extremely happy with the watch. Perfect fit, comfortable and not to hard to set up. this is a really nice looking watch, as its my first g shock i thought it was going to be to big and bulky but not so it fits perfectly round the wrist and is surprisingly light. Fantastic watch. Perfect for being physically active in! Would highly recommend this to anyone! Good quality for the price there is no problem with the watch looks good working he have everything what I expected. This watch is great. I bought the black one, and it fit perfectly on my wrist, and even though I have very thin wrists, I am still the 4th notch from smallest and the 8th notch from biggest. It has lots of features two timers, 4 alarms with snooze, tide/moon charts etc and is very useful to have, especially for watersport enthusiasts such as myself. It is a tiny bit too thick but it really isnt that much of a bother, it is still a very convenient size. It came with a lifetime warranty too, so thats always good :. Great watch! Used it for a week and when I got it I thought the tide time indicator was a gimmick that I would never need, but I used it when working out when to hit the beach in Devon at the weekend. Much easier to use than my previous G-Shock with a much easier screen to see. Perfect for my hectic, active life. Very pleased with the price too. Nice watch, lots of features, including 2 stopwatches and 4 alarms, as well as an alternative World Time majority of which I probably wont use, like most buyers!, but the instructions for all functions, including the tide and moon function were actually pretty straightforward, so input those anyway. Design is chunky, more so than my sons, being the same face size but more bulk protection? around the face. Good quality strap and keeper actually does its job unlike a blue G Shock I bought a few months back and dont wear cos of this. VERY pleased with watch, recommended. Quality watch. 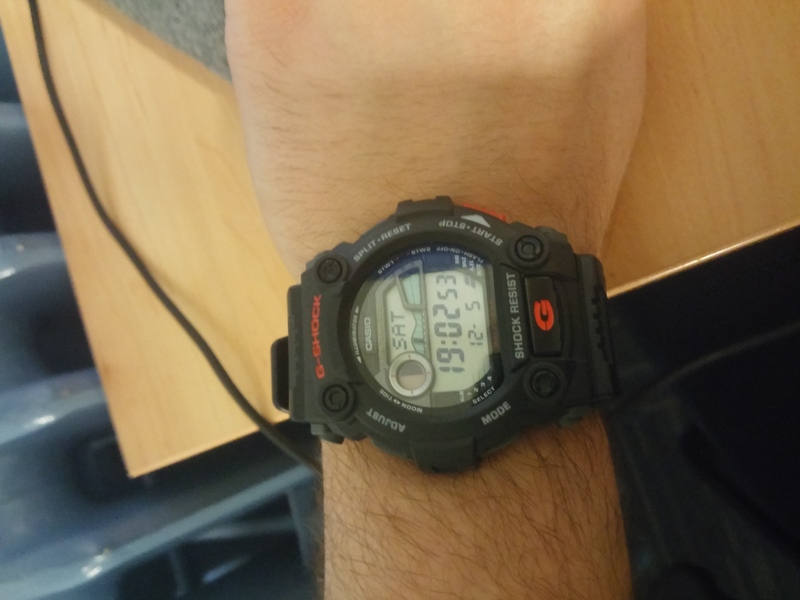 This is a replacement for my old casio gshock rescue alarm watch. My old one took six years of battering before any problems. Casio were good about fixing it but decided to get a new one as the last one was well worn. I found on the old one the strap used to come out where it joins the watch unit but this was solved by getting a watch shop to put a deeper hole in. Excellent watch would and have recommended it to anyone active or has a bad habit of bashing their watches. Great watch I bought this as the functions matched my G-Shock Mudman which is no longer for sale. My Mudman lasted 4 years before the strap broke perished in the Sun as worn daily in hot climate actual watch still works fine. 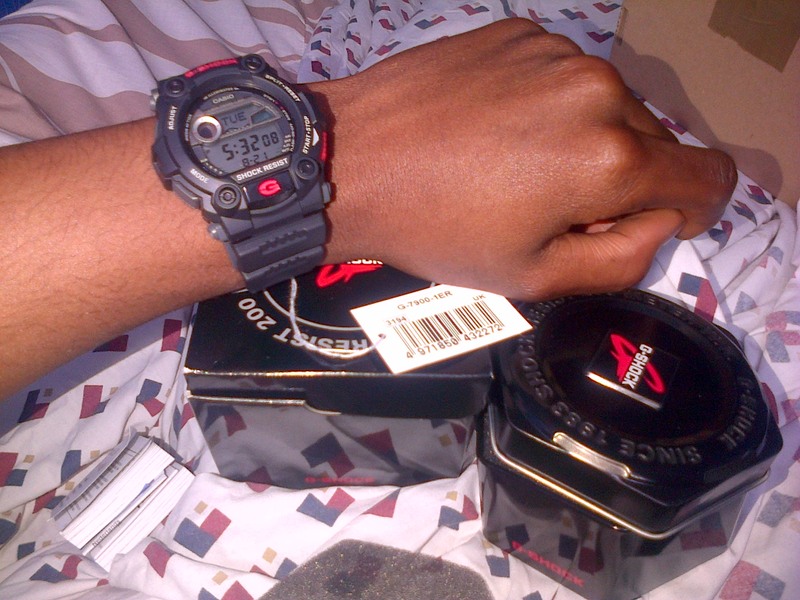 I always buy G-Shock as theyre hard wearing, user friendly and good value for money. No complaints with my recent purchase, would recommend and for just over £60 its a good price too. Watch seems to be very good, took me a while to figure out how to change all the settings to the UK. but overall seems to be a good watch. Great robust g-shock. As always Casio never fails to deliver. I have the g-shock gulfman and this is definitely an upgrade. The tide function is very accurate and sea water is no problem ether. I turn the auto lumination off to save battery but its a quirky function too. Almost kept it for my self. Chose the gift wrap service and it was very nice too. Delivery was also very impressive and quick. Bought this as a present for my son for Christmas who is about to join the RAF. Looks good, very comfortable to wear, no too bulky but masculine looking. My only concern is the instruction booklet which was so small it was impossible to read the instructions to set it up, adjust time etc. I am still trying to work it out 3 days later. One sheet of paper with basic instructions would have been really helpful as a magnifying glass not always close to hand! Product is a Christmas gift for a male involved in yachting, so not able to review the watch features other than it looks good. Service from Watchshop fast and efficient. Fantastic product, have always bought g-shock watches, good robust watches, great design, light to wear. High quality watch. Good size, good colour. The red on the dial sets off the effect of the design. Great discount for a great watch. Chuffed. I exchanged the original purchase as it faded and was deemed faulty. I was not happy with this product. However, your store exchanged it for a black G Shock watch which I wear everyday. It is robust and good looking. Thanks!! Watch is perfect, exactly what i was after. Its a very fresh watch, the colours are super cool along with the moon and tide graph, very easy to setup. worth every penny. Great g-shock model,Very robust,and a good looking watch,in black.Has backlight,stopwatch,day date,waterproof 200 metres,i really like these watches,they make a great gift. Bought this watch because Ive always wanted a g-shock due to their style of watches being ideal for things i do. Beautiful looking watch, very practical, great features such as the tide/moon state. Cant find a single fault with it! A very tough looking and quality feeling watch. I own several watches but wanted something I could wear everyday and this fits the bill. Its very comfortable to wear with the 2 wings either side of the straps. Has all the features I need, plus some I never will, and it is easy to operate and adjust. Whilst the watch looks chunky and tough the materials are surprisingly soft to touch and have a nice weight without feeling too heavy. The features of the watch were absolutely amazing, all the expectations for a chronograph watch has met, very stylish and functional, value for money. I find this watch a little frustrating due to the settings but this is very much personal preference. That is however where there negativity stops, I travel widely as a wildlife tour leader and conservationist and this puts me in some difficult environments where watch straps rot or become brittle and fogging can occur. Additionally Im fairly clumsy so likely to smack the watch a few times. Its safe for me to say I have put this piece of kit through all those tests and its come-up trumps. The illuminated display is very clear and the buttons easy to operate. I think some may find this watch a little large for their tastes but I believe it to be subtle enough but still with a chunky feel. The display its self is quite cramped and I would have preferred a larger display. All in all a good buy and one I wouldnt fail to recommend for the cheaper end of the spectrum of traveller/robust type watch. Watch is great, nice size and the fit is very comfortable. Functions are easy to use. Great watch for the price. The watch looks even better in real life than in the Watch Shop picture. The watch is real mans watch. This is not my first G-Shock and I always surprised how is looking good on my wrist. Speedy delivery by the watchshop would purchase again. Fantastic watch, brought for my 11 year old son ...... He loves it, fit is great. Lots of great functions ....apparently is the watch to have at school .... A must buy!!!! execlent watch quick and eassy to set up. I also like the fact that you cat a normal battrey instead of a solar powered one which on my expernce do not work. I also like the fact it has to small grips on the wrist band to help hold it in place. This is a really good looking and functional watch. Im really impressed with the ease of use and clear instructions. It is a quality time piece and I would recommend it to anyone. This watch is really good. Dont think about it just buy it. For me it came in 24hrs. It will last you forever and your friends will envy u soo much. Great watch, I am loving it. Good size, I am 67 and other watches look too small on my wrist. 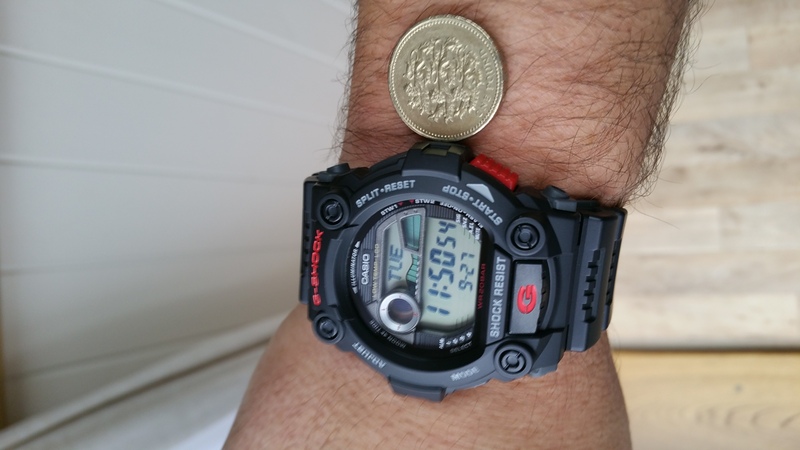 The G-Shock looks great, it is a big watch suitable for a big guy. Great product and very reasonably priced. Good features and easy to set-up and use. The watch is good,easy to set up and child friendly.There was a little bit of difficulty setting up the tide and wave but other than that the watch is very good. Chunky, solid watch. Bought for work and hasnt disappointed. Great fit and quality at a reasonable price. The watch ive purchased is absolutely fab. I bought it as anniversary gift for my hubby, he was rather chuffed. Perfect. i got the watch and inside of 5 minutes i had it programmed with time, alarms ,world clock. i really got the watch for work as the shock resistant side of the watch is what i was looking for , you dont even feel like the watch is on its so light , the strap is extremely sturdy and so is the watch , the light function is of a very good standard, if you do strenuous work this is the watch for you without question, i am extremely please with my purchase this is the best watch i have ever owned, i trust me when i say i have owned alot. I have always liked the G-Shock. They are a perfect watch for work as they are bulletproof. The alarm beep is very disappointing. Only audible when held to ear which is not much use! Received this item as a gift and was impressed with it straight from the box. It has been used as intended for Marine Search and Rescue. The tide function is useful to give a brief idea of whats happening, but cant be relied on fully a combination of this and tide tables is best. Setting the tides and moon function correctly is a bit of a hassle but with some searches on Google, I found out how to do it. However the British Summertime function does affect it and means that you have to set it up again. I like the contrast of red and black, only downside I see is that it is not available in Solar Power in this colour scheme. The numerous alarms, world time and back-light are also useful. As for the durability, well so far I have had no issues. Its been bashed off sharp rocks, dunked in saltwater and mud on numerous occasions and taken plenty of knocks and so far seems to still work! The straps strength and durability concerns me as my last one fell apart and off my wrist without any prior notice although this was not a G shock but a standard Casio. This cat is real smooth baby , fits like a glove and has all the functions I need ,so far so good, the final test is when im next in a big rammy with some lowlife who is getting the jail and hopefully it doesnt get damaged! Excellent. Stylish. Big. Having researchedcmy purchase in a shop O knew this was ideal. Functions good and the size is as big as you probably want to go. Nice colours and looks macho enough. Strap is ok, but could be a smidgent thicker and the buckle looks a little cheap. All in all a pretty robust watch. I am action man, got moving eyes and everything, watch stands up well. I was looking for a new watch for work, and was influenced from the movie End of Watch. I walk my dog a lot on the beach, and having a tidal guide is such a helpful feature. This is a comfortable watch to wear and a good size as I have quite big wrists and didnt want a small watch. That said I wasnt looking for a large watch that looked too big or could get caught/damaged. Would recommend to anyone wanting an easy to read watch for any activity. Color is fine,easy to read the time,a bit complicated for setting up the time.in for the younger people,appears cool to get the attention of the ladies. Pleased with the watch easy to set up and operate. Instruction provide data for setting moon and tide phase for London, but offer no advise regarding setting for your true geographical location, this is potentialy trial and error. Fantastic watch with a great look and feel. Very comfortable to wear and easy to use. The features are brilliant.My son loves it and is the envy of his mates who all now want to get one. A massive hit. The G Shock is not just a watch its an experience. This was a gift for my grandson. He thanked me so many times for getting this watch. He loved the colour and style and felt the service was speedy in terms of delivery. Bought this Watch for a friend. He loves it- It contains lots of features such As stopwatch, timer alarms, its a stylish watch, great looking with lights , durable and will be a pleasure to wear. Its also packed with several other features such as the tide graph, moon age and world times. Product is fantastic - customer service excellent - quick delivery - great communication. 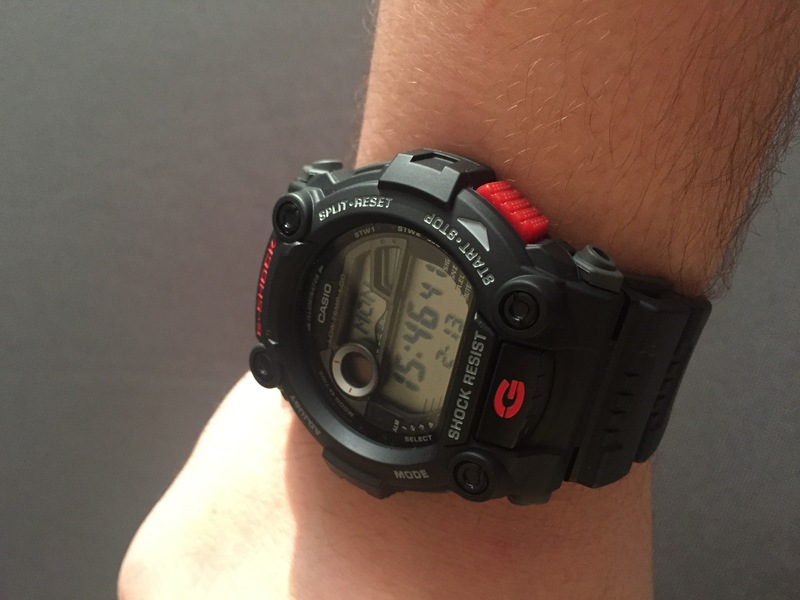 This is my first G-shock and i wanted something very casual and reliable and this was an excellent choice. Its really huge so looks like a manly watch. The best part was setting the time-zone etc, it was very easy to follow the manual. Was lookin for another G-Shock watch for work, found the G-9100 1er, as usual with gshock good solid build, easy go set up & nice bright face easy to read, its a black watch and rubber strap, easy to work your way round the different featues. 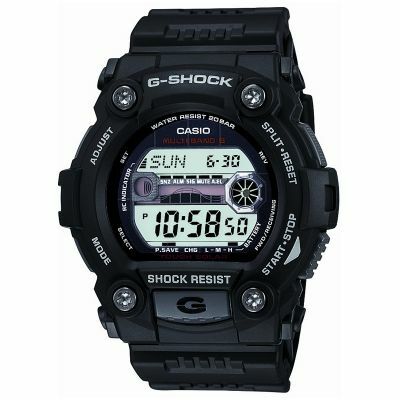 I ordered the G-7900-1ER, which is the black version. Delivery was next day and the packaging was in pristine condition. The watch is comfortable and sits easily on the wrist. The strap and casing are a kind of black/very-dark-grey colour and suitably non-shiny. The buttons are, as usual, wide and easy to use and are shielded by the case enough that you dont suffer from accidental pressing. Time+Tide+Moon+Date all sit on the normal screen. Stopwatch 1 on 3rd screen. This stopwatch has an automatic 5sec countdown that you can activate, with beeps, or you can use it normally. 1000hrs max. Stopwatch 2 on 4th screen. Standard stopwatch. 1000hrs max. Countdown timer on 5th screen. I use this very often. 99hrs max. Alarm 1,2,3,4 + hourly beep on 6th screen. The backlight is excellent, though I dont recommend activating the twist-on feature as it will always be coming on when you dont need it and the G button on the face of the watch is easy to press, even with gloves. This really is an excellent watch. It is chunky and has a nice tacticool look to it, whilst remaining non-flashy. Excellent service all round-great product at a very good price beating a lot of other well known suppliers!Excellent delivery service-arrived on the scheduled day earlier than anticipated. Great service-Well done Watch Shop!! This is an excellent watch from Casio. It was a replacement to my old watch I gave to a friend. Its well designed and great looking. All the features are useful and the light works well in all conditions, unlike other models Ive tried. cant do without a gshock and get a new one every 2/3 years purely coz i get bored or see a new model i like, nothing wrong with the watches. 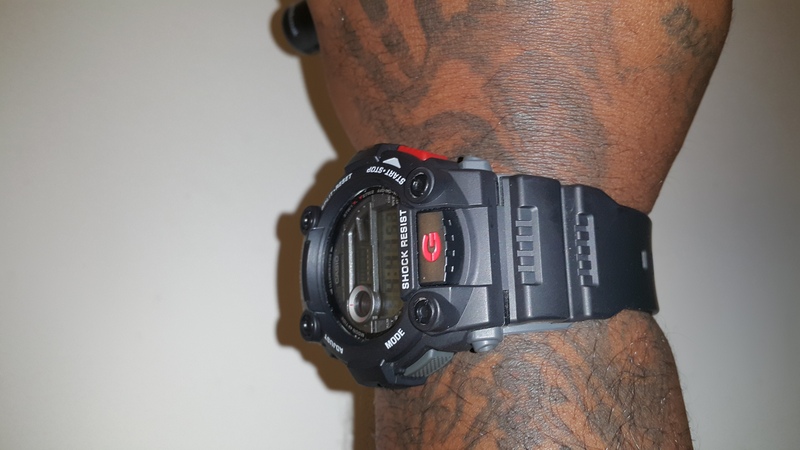 This watch is tough all round, trust me, youll already know the features it has if your looking to buy this one so... theyre clever features and work perfectly and simply. if you want the grescue i suggest you get it in this colour as its smart but also still has a bit of style with the red, the red and white versions are a bit too fashionable and more for trendy type. great looking watch, exactly as it was shown on the website, very pleased and excellent service! great watch great price fast delivery excellent customer service well recommended. Its really good we bought 2 one red and one black because we were really impress with yhe high quality of the watch my only concer is if the watch has a glass protector so the screen wont easly get sratch.. but overall its really good. I ordered this watch for my sons 10th birthday and it arrived promptly and looked good however the 10 minute digital display number had a fault which meant it couldnt display the numbers 2,3,4 and 5 correctly. Im hoping for a quick exchange so that my son isnt too upset on his birthday. Amazing product, excellent delivery time & price & Im very happy with my order! This watch is amazing got this for my 13 year old son on his birthday and he loves it very much and wears it everyday. This is a must buy watch and delivery was very fast came the next day. Robust watch with lots of features, countdown timer with auto repeat excellent for timing routines in the gym or elsewhere. 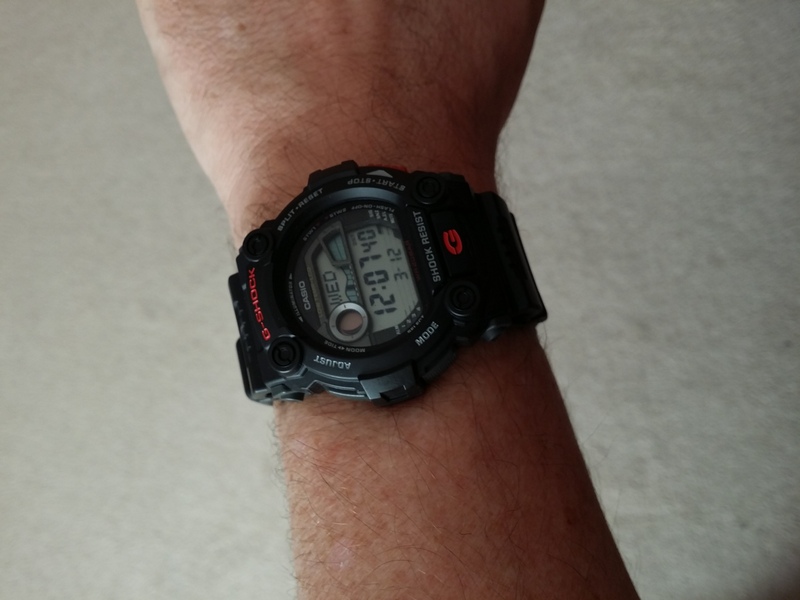 Previous perception of G Shock was too big & bulky, not this model it looks good on my wrist. Time will tell with the strap, it may require replacing at some point but the watch should give years of use. Good watch... brings back good memories of my previous G Shock! This watch is amazing, it looks good and the functions are just as good! I love it, definitely worth a buy! Lovely smart looking watch, I'm sure my hubby will be pleased with it. Fast delivery. Well packaged. Would buy again from them. A reall great watch and at very reasonable price too. Ordered in the afternoon and it turned up first thing in morning, superb service ++++++++++. i love my new watch. good deal. this is my first g-shock and can say not last. Brilliant purchase, fits your wrist perfectly looks the part too! Very robust and hardwearing. Its made me want another coloured one!!! Dont ponder just buy it and at the price it was BARGAIN!!!!!! Found the watch to be much lighter than expected and was pleasantly surprised at how clear the display was. Good shape with large digits and good plastics. I also have a mudman but that one is having softer strap and body. Great watch - Great looks, great price and does everything a watch needs to do. I wanted a durable but good looking watch I could take away with me on holiday - I couldn't have asked for any better. I have long been using wristwatches Casio. I had to watch for outdoor activities. 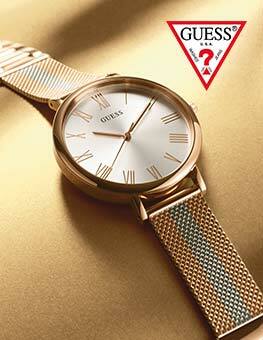 My choice fell on this model, since these watches are very reliable, lightweight, cute design. I like the color combination of this model. They can swim and even diving. In this model, the successful combination of price and quality. And they're not Chinese! Also, these watches come in beautiful packaging, this is a good gift ! Great watch if you are looking for a practical, durable piece of kit. Likes: Functions are easy to navigate with a bit of practice. Tough and practical. Dislikes: Slightly too big. Agree with other reviews that is best suited to jeans and sporting endeavours. You can't wear it with a suit as doesn't fit under shirt cuffs. This watch is great! It's a great fashion icon and having a G-shock is the envy amongst friends. Firstly I like the design of the watch, I reckon its the most stylist available and the colour of black and red is awesome. the watch is very light and smaller (better than expected, as the picture makes the watch look chunky but its not). the material and feel of it is great too, like plastic soft feeling and you dont have to worry about the strap getting creased because its plastic. it fits great on your wrist and is also very sturdy. Recommend too the young and old and is another great make from Casio! The G Shock I bought was brilliant, hubby has always worn one and loves it. He loves how durable and robust it is. The colour is suitable for his line of work, doesnt scratch or mark, can be easily cleaned too. This is my 2nd Rescue, the 1st was stolen, so very pleased to find it at a good price on here. This watch is awesome, strong, robust, looks good on the wrist, a proper Saturday night with the Jeans kinda watch. Easy to view and great to wear when competing in sports events. Great watch, great finish, great webite. Bought as a present for my husband for Xmas and he has used it constantly. He is a fan of chunky watches and was not disappointed. He has used it as a day to day watch and also for running and going to the gym. A great sturdy watch with plenty of useable features.